What The Fudge Is Everyone’s Problem? 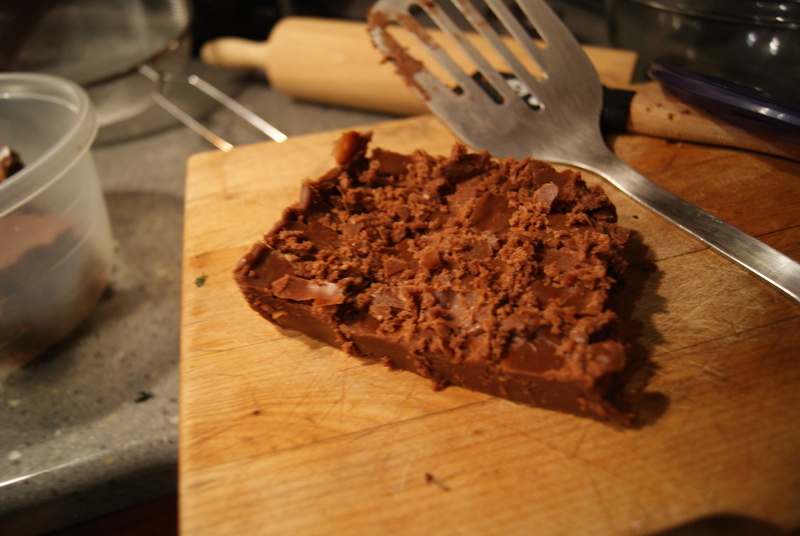 Also, Fudge. You GUYS. I am SO MAD! I’m not even kidding. I’m so… mad. I wish I were kidding or talking about something kind of insignificant. Okay, yes, I am a bit disappointed in the latest season of Arrested Development. All the random cameos–especially of the people from Outsourced… brown peeps, don’t even play like you weren’t as happy as I was to see those guys–did kind of lessen the blow, but wow, it kind of isn’t that great, right? All jokes and television programs aside, though, I’m finding myself really disappointed in the level of toxicity around me. BUT SHIBOW. YOU LIVE IN NEW YORK. YOUR WHOLE HOOD MUST BE LIKE THAT DIRTBAG FROM THE PEANUTS CARTOONS. I made the joke for you. You’re all welcome. Har har. Inserted to break up the tension. It’s getting too serious, ya’ll, I know. Sorry. I realize I sound pretty snippy and irritable. Those are two things that I presently am, though, and it ain’t because of the strange smells coming from the return of the New York City summer. It’s mostly because I’ve found myself in contact with some really foul moods lately, and I’m not a fan. I’m not interested in fighting or yelling or throwing fits or treating people badly, and I cannot comprehend it when others are. Seriously, I think in the last week I’ve had to deal with each of those things at least twice. Why treat someone poorly over nothing when you have no idea what the object of your wrath/annoyance/twisted amusement is possibly coping with? I’ll just never understand it. Also, last weekend I kind of went on a baking rampage and churned out like seven different amazing goods, from rosemary rum cocktails to well, fudge. It sort of healed me in a weird way. And now I hope it heals you :). 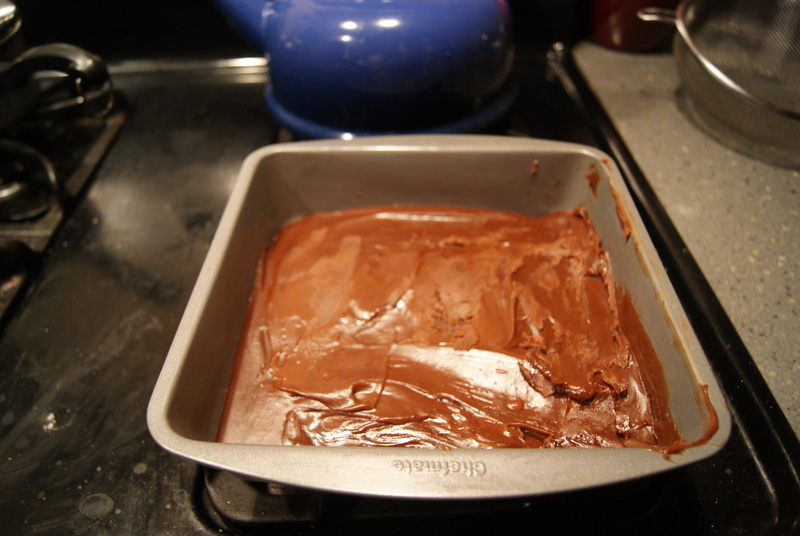 Grease the bottoms and sides of an 8-inch square baking pan with butter and set aside, and have a candy thermometer ready as well. 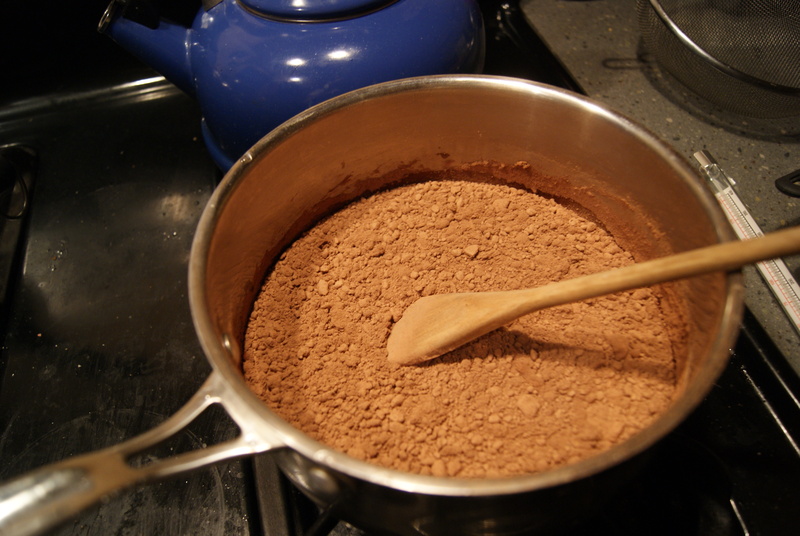 In a large saucepan over medium heat, combine sugar, milk, corn syrup, salt and cocoa, stirring constantly, until the sugar has dissolved and the cocoa as liquefied. 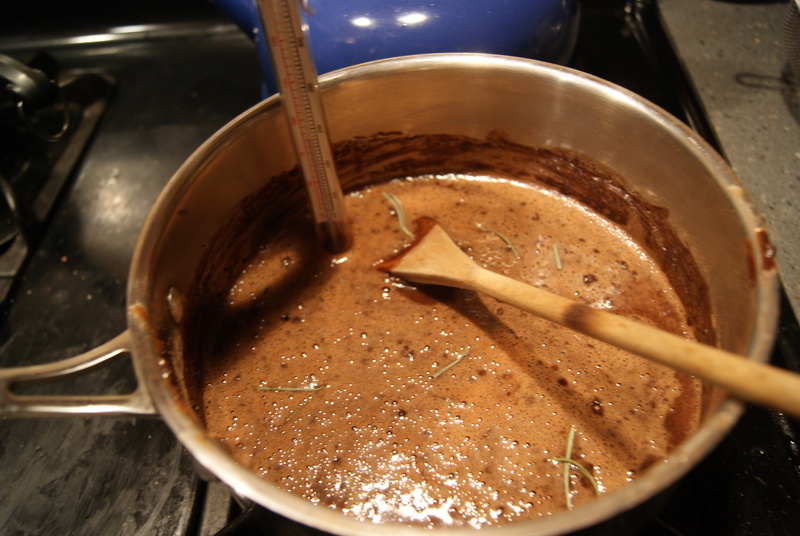 Stir in your lavender, if using, and cook until your thermometer reaches 234°F. Keep watch over this thing; after the mixture reaches boiling, the temperature will increase rapidly. If you don’t have a thermometer, keep cooking until a small amount of the mixture forms a soft ball when dropped into a bowl of cold water. I’ve used this trick. This trick is what’s up. Good trick courtesy of the internets: Lay a wooden spoon over a pot of boiling goodness to keep it from spilling over. Remove mixture from heat and stir in your butter. 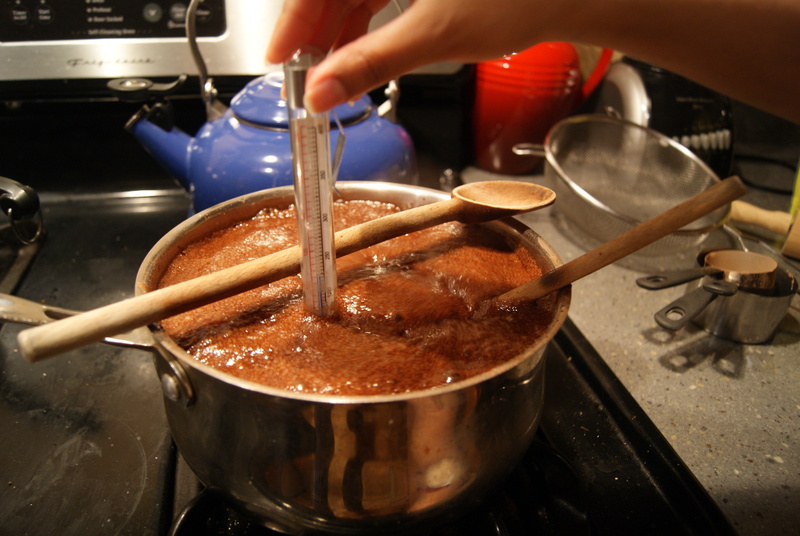 Cool to 120ºF, without stirring, which should take about an hour. Add vanilla, then beat the mixture vigorously with a wooden spoon– no stopping, so have a trusted adult nearby just in case– for 5 to 10 minutes or until the fudge is thick and doesn’t have a sheen to it. This took me about 6 minutes. Spread evenly in pan and let stand until firm, about 1 hour. Cut into 1-inch squares once cooled, and store in airtight containers (if you can bring yourself to step away from these babies). 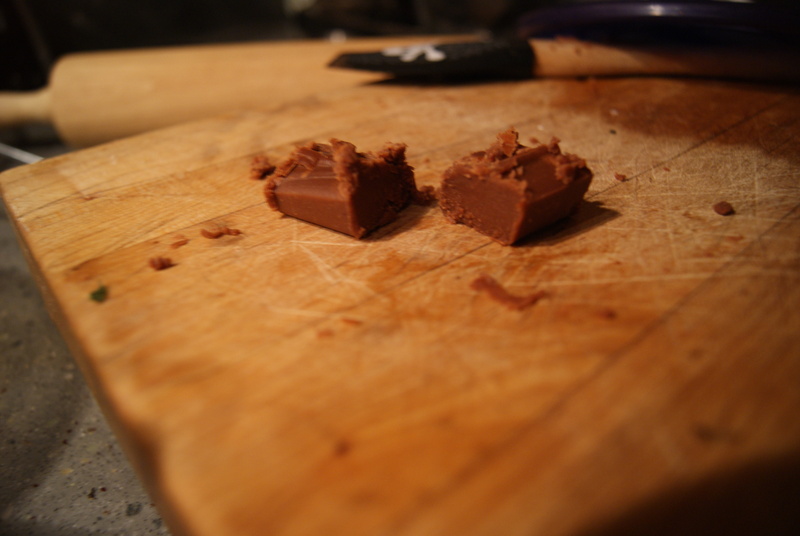 So, it’s a little hard to cut these without getting little bits of fudge popping out all over the place. I found that eating those little pieces helps quite a bit, though. Food for thought…and for your belly. Unbelievable. Insane. Insane. Since I’d also made marshmallows when I made these, we decided to try s’mores made with this fudge instead of a chocolate bar. Holy…holy holy. I can’t even tell you. I just can’t. I can still, one week later, taste that miracle in my mouth. Just… do this. ← It’s A Marshmallow World. A Lemony, Lovely, Marshmallow Bleepin’ World.